It is six months since the guns of Operation Panther's Claw fell silent. It was the biggest British military operation last year and left 10 soldiers dead and many others seriously wounded. The last time I was in Spin Majid, we were surrounded by hundreds of heavily-armed troops, in the midst of an intense and bloody battle to take a large swath of territory from the Taliban. Danish tanks blasted insurgent hideouts, the air crackled with the sound of pitched gun battles, attack helicopters hovered overhead and, every few minutes, there was the nauseating blast of IEDs (improvised explosive devices) - bringing a brief but heavy pause to the march forward. Today there is a school in Spin Majid; there is a new road, a clinic is being built and even a tiny market has opened that Regimental Sergeant Major Jon Sheard jokes is the local Whitewater shopping mall. It is the centre of a battle for influence under way not just in Babaji district but across Afghanistan. It goes to the heart of the counter-insurgency strategy in the country. 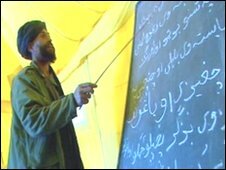 But although the Taliban no longer have free rein here, they maintain an insidious presence. 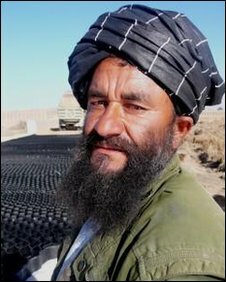 Najibullah is one of the teachers at the school. He looks nervous as we arrive with a group of soldiers from the Coldstream Guards. It is their prize project in the district, one that must be made to succeed. For now the school is housed in two yellowing tents while a permanent building is finished. A few dozen small, raggedy children clutch colourful new textbooks and holler the words written in the local Pashto language on the blackboard. While the soldiers wait outside, the teacher reveals why he is so pensive. "I will be honest with you, security is good and bad. The Taliban have threatened all of us. "They say that if we run this school, they will do such terrible things that we cannot even imagine." The parents have received the same threats and the empty desks are a testament to the insurgents' ability to wage a campaign of intimidation. There should be 180 children at the school; today there are just 40. One teacher is absent because of a dispute over pay and the other turns out to be a policeman. Babaji district is home to the Coldstream Guards Battlegroup. They have made important steps forward here but as the school shows, they also face significant obstacles. Like the Pied Piper of Babaji, Sgt Maj Sheard is shadowed by a trail of small children trotting along to keep up with him. "Salaam aleikum, sangay?" He asks how they are. The children are hoping for sweets and pens. He recognises that this is a battle that you can be winning one day and losing the next. But he says they have the time and patience to see it through. "It puts the Taliban on the back foot. It is a 360-degree battle [to] win the hearts and minds of the locals." Four years into the conflict in Helmand and the British military still talk about the "ink blot" strategy. The idea is that if you can create a small centre of security and progress then that will spread out. There are places where this has happened, like Garmsir, the town that lies further south of here. But it is a strategy that requires enough properly-equipped boots on the ground as well as political and public patience at home. All are in short supply. Babaji district is an underdeveloped district in a country that still languishes at the bottom of the league table of poor nations. Most people here are subsistence farmers untouched by modernity. There are no telephones, no postal system, no electricity, no televisions or computers, no sewage system, no electricity and the only real road is currently under construction. 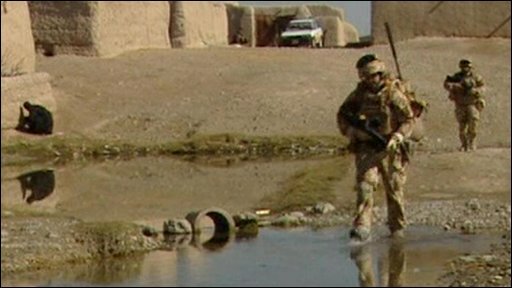 The British-funded "Route Trident" is an ingenious construct using a new material called Neoweb - a plastic, honeycomb strip that offers some resistance to the IEDs that have killed and wounded so many in Helmand. The Royal Engineers employ local workers on the project and as well as putting some money back into the local economy they hope it will eventually link Gereshk, the economic heart of Helmand, with Lashkar Gah, the provincial capital. The importance of roads linking communities is not lost on the counter-insurgency experts - or on the Taliban. Every few days the construction site is attacked with guns or rocket-propelled grenades. Abdul Ahad, one of the labourers, says the project is good for the locals but describes how the insurgents have intimidated some workers into staying away. One was beaten badly and has not been seen since. He points to the north and the south and says the Taliban are in those areas. Like so many Helmandis, what he wants above all else is peace. So who does he want to be in charge here? "Whoever brings security for us, whether it is the Taliban, the British or the Afghan army. Whoever it is, we want them." There is a sense of urgency about the Nato-led Isaf (International Security Assistance Force) mission in Afghanistan, a need to create momentum and to do so quickly. In the coming weeks there will be more large operations like Panther's Claw to try to unseat the Taliban in this part of central Helmand. But the mission will only stand a chance of succeeding if there is something meaningful to fill the vacuum left. In Babaji there are few Afghan soldiers or police and there is no local government. They are all key components of the strategy as laid out by the overall commander in Afghanistan, US Gen Stanley McChrystal. It is striking that the military do not talk about "victory", not even about "winning" or "losing". For now the twin objectives of the mission are progress and momentum. There is evidence of both in Babaji but it remains slow, patchy and messy. This year will mark the fifth summer of fighting in Helmand and despite the advances there is a lag between expectations and resources. That could change with the injection of tens of thousands of extra US troops, part of the American surge. But every year so far, every increase in troop numbers has lead to more violence and bloodshed and for now, success remains as elusive as ever.